This like many others is one i have been wanting to make for a while, with the rising sea levels many cities around the planet will be partially submerged on the sea by the end on the century, these inundations will happen on huge storms, where millions of dollars in damages will occur, what a challenge, what will we do? ◙ Two central high grounds allow for very interesting positional plays. ◙ 8 and 1 Third bases are exposed from the North & North West respectively, players that take said bases need to be careful with snipes. ◙ 7 and 3 Third bases must be taken with a standing army or with the intent of putting pressure, a player that takes said bases can destroy the collapsible debris tower to help with the defense of the base, none the less it will not shut down any harass by itself. ◙ Scenarios where the map gets split in a NorthWest/SouthEast fashion are not uncommon, it all depends on the player's choices. I'm really not a fan at all of using textures in a naturalistic fashion (specially snow or sand) since they obscure the top down overview of the map and make it look messy, the bugs with the Fog and shadows, and water not displaying correctly on the editor make maps look even worst. Feedback regarding the aesthetics of the sand are more than welcome. Disclaimer: All the logos included on Miami 2100 are propriety of their respective owners, believe it or not i do not own Shell, nor Exxon or any other company nor logo that's on this map other than the KTV Map logo, plz don't sue me, i just want to make pretty maps. Edit- didn't notice its a mirrored map. Since you can chose between a forward and standard 3rd, that kind of symmetry should work pretty well. Anyways, dig it! Gorgeous ! The layout seems standard enough but you should be commended for such an awesome work on aesthetics. Cool map, really like this one! 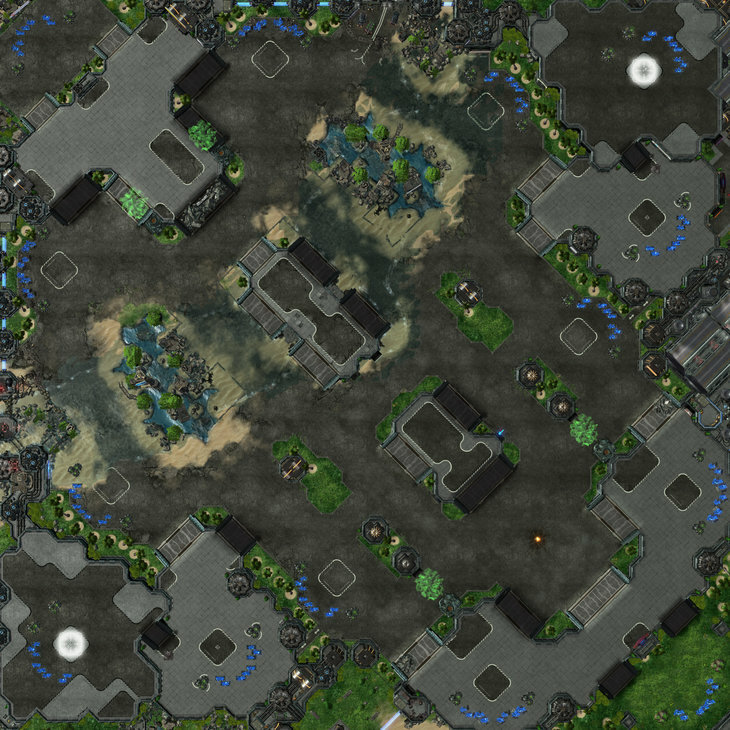 My only critizm would be that I think both ramps towards the natural should be 3sized with that 2nd-3rd layout. This is a really intelligent design. Should produce good games if it's played on by experienced players. This looks like such a fun map. It is actually, i had a ton of fun messing around with this one (i have fun messing around with any map tbh :b). I don't really agree about the ramps, the nat2nat rush distance is very linear on this map which allows players to set up counterattacks quite easily, the x2 sized ramp allows enough of a defenders advantage so the counterattacking player will not want to attack right up to the natural giving the defender a small time window to set up a small last defense in his natural by when the attacking player's forces finish ravaging his third/fourth. Very nice map, a bit chokey, but really well done! Since the defender is already on the highground and rallies down that ramp when being aggressive, I think it will be very well protected anyways. Counterattacking into the natural will be very early spotted this way and gives a few emergency seconds to raise the depots or warp in that zealot. Plus going up such ramps is usually risky to begin with. 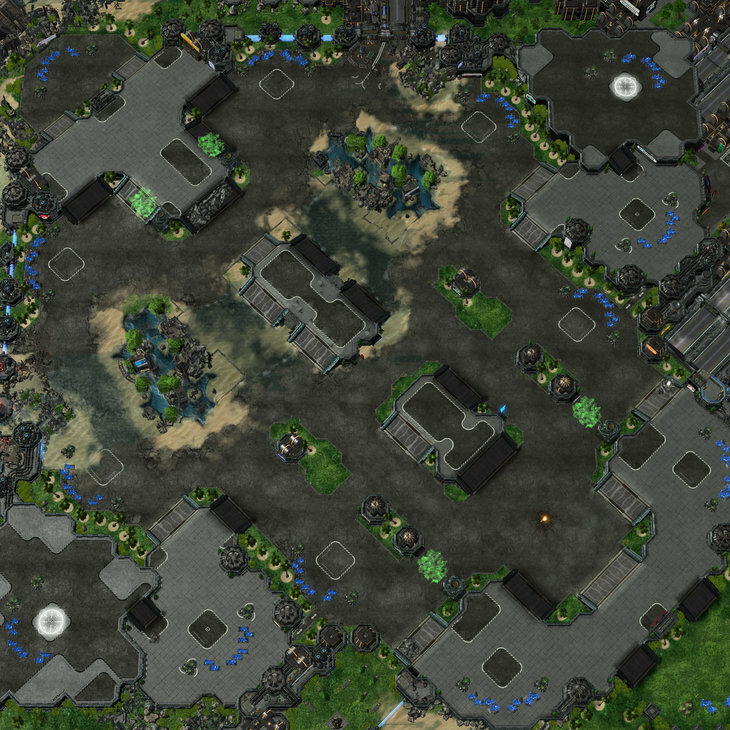 It's hardly a big thing whether it is 2x or 3x I think, I guess it's better this way for Protoss.